Packaging Outlook 2018: Paperboard Packaging Overview | Planet Paper Box Group Inc.
One of the cornerstones of the folding carton industry, and a reason for its continued stability, is the fact that most paper-based packaging is used for consumer staples. Nearly 60 percent of all paperboard packaging is used in food product segments such as beverages and dairy products, candy and confections, dry foods and frozen foods. The remainder of the market serves segments such as pharmaceuticals, cosmetics, toys, and most of the items found in grocery and club stores. While definitely not recession-proof as many in the industry have liked to say, it provides a level of security to the industry. There is positive news in the folding carton markets regarding the relative stability of tons of paperboard shipped, but the value of those shipments continue to slip. In 2016, the last year for which complete figures are available, the North American industry shipped 4.9 million tons of paperboard packaging with an average value per ton of $1,753, according to the Paperboard Packaging Council (PPC). This is nearly identical to 2015, with just a slight dip in the value per ton, which in 2015 was $1,765. Heartening news can be found in terms of workforce numbers; after shedding jobs every year since 2012, more than 1,000 jobs were added in 2016, bringing the total to 40,442. This, incidentally, is only the second time in the prior decade that the industry crossed the 40,000-job threshold. The dollar value of shipments dropped for the second year in a row, from $8.71 billion in 2015, to $8.59 billion in 2016. This is the lowest mark for shipment value in more than a decade. The last time shipment values were this low was 2004, with values of $8.53 billion. While the PPC predicts growth from the period between 2016 and 2020, it is conservative, at best. The industry is expected to grow at an average annual rate of 0.3 percent in sales and 0.5 percent in tons. The average value per ton per year is expected to drop 0.1 percent. RISI (risiinfo.com), an information provider for the global forest products industry, believes that, like 2016, 2017 was a year of marginal contraction. 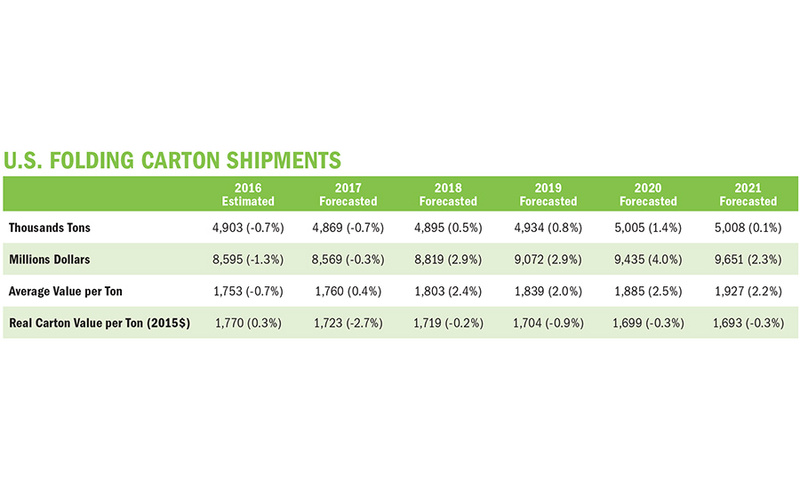 RISI forecast folding carton shipments drop by 0.7 percent. Despite the slight stagnation, RISI estimates folding carton shipments will increase 0.4 percent annually over the next five years. Shipment growth is expected to be healthiest in the middle of the five-year forecast, with RISI anticipating an economic slowdown in 2021 that will lead to flat shipment growth. PPC’s TRENDS 2017 Report – All forecasts and analysis presented by RISI, Inc.
RISI predicts the total value of U.S. carton shipments to grow from an estimated $8.6 billion in 2016 to more than $9.6 billion in 2021. Average annual values per ton are predicted to increase 1.9 percent per year. The PPC continues to warn about the negative effects associated with increasing boxboard prices and the impact they have on profitability. From 2011 to 2016, paperboard costs rose annually at an average rate of 2.2 percent. Compare this with the 1.3 percent increase in the average value of folding cartons, and it is easy to see the problem. 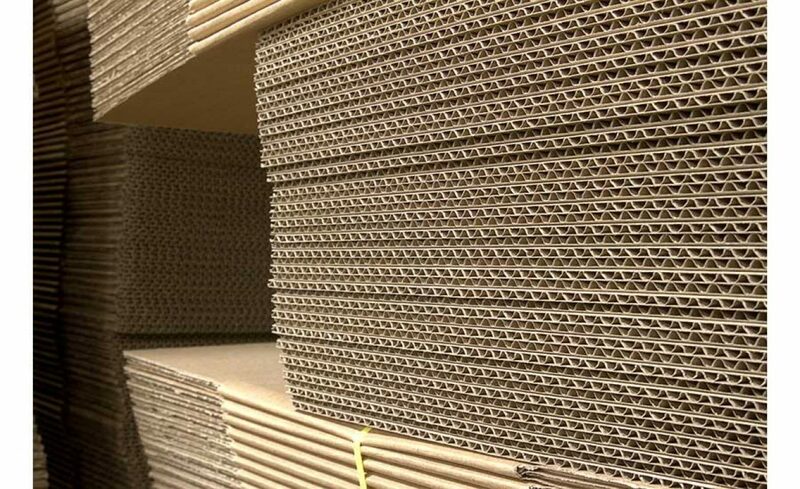 New European capacity, in combination with oversupply of cartonboard in China, has helped to push U.S. boxboard prices downward. Nothing has changed in the general breakdown of the industry. Independently owned private companies, defined as converters who do not own their own mill, comprise about 20 percent of industry sales. Market share has declined from approximately 30 percent over the past 15 years, due primarily to industry consolidation. According to research conducted by Smithers Pira (smitherspira.com), the value of the global cartonboard packing market passed the $100 billion mark in 2016, consuming more than 40.3 million tons of material in folding carton and micro/miniflute packaging applications. Several market influences will combine to push worldwide demand for cartonboard in packaging to increase at 4.0 percent annually until 2022, creating a global market value of $124.1 billion in that year. The corrugated industry has made small, but sustained, steps since shipments plummeted following the crash of 2008. For 2016, the last year for which final statistics are available, the industry experienced increases in both the size and value of shipments, a welcome positive development. According to statistics compiled by the Fibre Box Association (FBA), corrugated industry shipments totaled more than 376.4 billion square feet in 2016, a 2.1 percent increase over 368.6 billion square feet in 2015. The value of shipments increased to $30.8 billion. While only a 0.8 percent increase over the prior year’s shipments, it’s the seventh straight year of growth. In 2015, the value of industry shipments increased to 30.5 billion, up from $29.8 billion in 2014. One thing in the corrugated market that forecasters can always rely upon is the breakdown of shipments delivered from corrugator plants (companies with their own corrugated production machines) versus sheet plants (companies purchasing corrugated sheets from a corrugator plant, which they then convert) remaining virtually unchanged. Eighty percent of industry shipments in 2016 came from corrugator plants, while 20 percent came from sheet plants, as has been the case for at least a decade without a single percentage change. In addition to volume and value, productivity continues its upward trajectory. The average corrugator plant manufactured 1,010 million square feet of combined board in 2016, compared to 968 million square feet in 2015. In the ongoing commitment toward sustainability, slow and steady seemed to rule the industry as basis weights inched downward. In 2016, the average basis weight of corrugated board was 131.3 pounds per thousand feet, a miniscule tick downward from 2015’s average basis weight of 131.4 pounds per thousand square feet. While single-wall corrugated board continues to dominant in the industry, there was a slight downtick as it accounted for 90.4 percent of all production, compared to 90.7 percent in 2015. Corrugator plants consumed 30.8 million tons of containerboard to produce combined board, up from 2015’s 30 million tons. 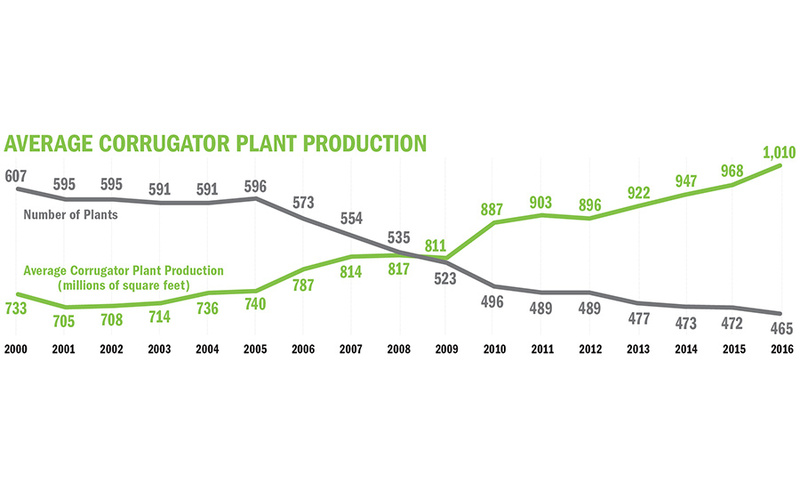 Consolidation continues to shrink the total number of plants in the industry, although the dip from 2015 to 2016 was relatively minor. In 2016, 1,155 industry plants were in operation. Of that total, 465 were corrugator plants and 690 were sheet plants. The workforce in the corrugated industry saw its first increase in a number of years. The number of employees in industry production was 57,075 in 2016, up from 56,227 in 2015. Not a substantial increase by any means, but a welcome development, nonetheless. Although the workforce growth was anemic, productivity continued to scramble a little higher over last year’s mark. Productivity in 2016 was 3,790 square feet per production man-hour, up from 3,670 square feet per production man-hour in 2015. IBISWorld (ibisworld.com), a business intelligence research firm, expected the price of corrugated boxes to shift direction in an even more aggressive fashion and rise 3.9 percent in 2017, much of it due simply to converters passing along increased material costs to consumers. Demand for retail-ready corrugated boxes, which allow the shipping containers to also serve as the retail packaging, is projected to increase 5.6 percent per year to $3.3 billion in 2020, according to industry research firm The Freedonia Group. Growth will outpace the overall corrugated box average due to continued solid expansion for revenues and store units among retailers that require retail-ready packaging, specifically club stores and limited assortment deep-discount grocery stores. Additionally, gains will reflect the presence of value-added features on retail-ready corrugated boxes, particularly high quality graphics and customization of box design. The sustainability movement—the single most important development in the converting industries in the past decade—sees no signs of abating. While data often vary among research sources, all can agree that the green market is growing. The global green packaging market is primarily driven by a paradigm shift among consumers who now demand increased environmental awareness from packaging producers. The challenge for folding carton and corrugated converters is to discover the most effective means to let consumers know the environmental benefits of their products. A recent report from Zion Market Research Global (zionmarketresearch.com) finds that the green packaging market share was valued at $161.50 billion in 2015 and is expected to reach $242.50 billion in 2021, growing at a compound annual growth rate (CAGR) of 7 percent between 2016 and 2020. According to a report from Allied Market Research, the global green packaging market generated revenue of $132 billion in 2015 and is expected to reach $207 billion by 2022. The sector grew at a CAGR of 5.41 percent from 2016 to 2022. The food & beverage segment accounted for more than 60 percent of overall share in the applications segment. In the realm of sustainability, paperboard packaging options such as corrugated and folding carton are beginning to be seen as the most environmentally friendly packaging option, especially as consumers see the devastating effects plastic has had on the oceans. According to a report from a GlobalData (globaldata.com) global consumer survey, 65 percent of consumers globally always or mostly recycle product packaging and 53 percent always or mostly avoid excessively packaged grocery products. Leading retailers such as Target and Walmart have already outlined aggressive sustainable packaging goals, and just recently at the World Economic Forum in Davos, Switzerland, 11 global companies announced that they will work toward using 100 percent reusable, recyclable or compostable packaging by 2025 or earlier. The companies include international brands Amcor, Ecover, evian, L’Oréal, Mars, M&S, PepsiCo, The Coca-Cola Company, Unilever, Walmart, and Werner & Mertz. Additionally, fast-food chain McDonald’s also pledged to recycle 100 percent of its customer’s packaging across the world by 2025. The threat from counterfeit goods poses a significant risk to consumers and to brands themselves. It is a problem that grows with each passing year and has yet to be adequately addressed as a systemic problem. Some of the statistics are staggering. Take for instance the fact that in 2016 more than 55 percent of the medicines purchased online globally were either of poor quality or fake. The anti-counterfeit push in the pharmaceutical industry, unsurprisingly, is growing because of increasing initiatives by the pharmaceutical companies, as the threats to end-users (and the inevitable lawsuits) are obvious. Folding carton manufactures are currently working to establish the means to better incorporate RFID technology into their products, including printing RFID sensor platforms that enable the printing of labels that combine a temperature and a first-opening sensor with a printed electronic Near Field Communication (NFC) antenna. The system interfaces with a smartphone, measuring and recording temperatures during the label’s lifetime, and also indicating whether the label has been opened or tampered with. The market for anti-counterfeit and security packaging will see significant growth over the medium term, with Smithers Pira estimating a market worth over $2.75 billion in 2015 and growing to more than $3.5 billion by 2022. Plastic v cardboard: which is greener?